How to Make Apple Jelly - Easily! Looking for How to Make Apple Jelly - Easily! in 2019? Scroll down this page and follow the links. And if you bring home some fruit or vegetables and want to can, freeze, make jam, salsa or pickles, see this page for simple, reliable, illustrated canning, freezing or preserving directions. There are plenty of other related resources, click on the resources dropdown above. 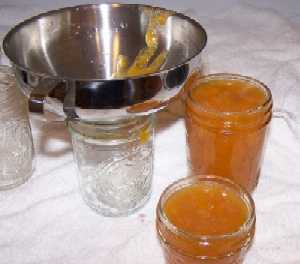 Making and canning your own apple jelly is quite easy. Here's how to do it, in 13 easy steps and completely illustrated. These directions work equally well for pear, peach, nectarine, plum and apricot jellies. For jam of these fruit, see this page; or see this page for berry jams, this page for Fig Jam and this page for Blueberry Jam directions! If you want to make crabapple jelly, see this page! Also, see our pages on tips for picking apples at a farm, easy illustrated directions to make applesauce, apple butter and apple pie; and our list of apple festivals! 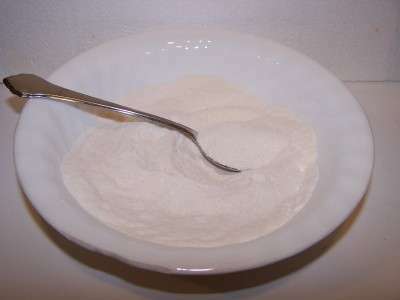 Pectin: Apples normally have sufficient natural pectin in them to form a gel, but I have found adding a half packet of dry no-sugar-needed pectin yields a more reliable set, and can substantially reduce or eliminate the need to add sugar. 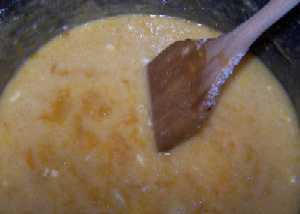 Note: 1 packet of dry pectins is equal to 3 Tablespoons of pectin. 1 Water Bath Canner (a huge pot with a lifting rack to sanitize the jars of apple jelly after filling (about $30 to $35 at mall kitchen stores and local "big box" stores, but it's usually cheaper online from our affiliates) You CAN use a large pot instead, but the canners are deeper, and have a rack top make lifting the jars out easier. If you plan on canning every year, they're worth the investment. The most important step! You need apples that are sweet - NOT something like Granny Smith's. Yeah, I know you like them (why do sweet women like sour apples???) and even if I did, they still wouldn't make good apple jelly - you'd have to add a lot of sugar. Instead, choose apples that are naturally sweet, like Red Delicious, Gala, Fuji, Rome and always use a mixture - never just one type. 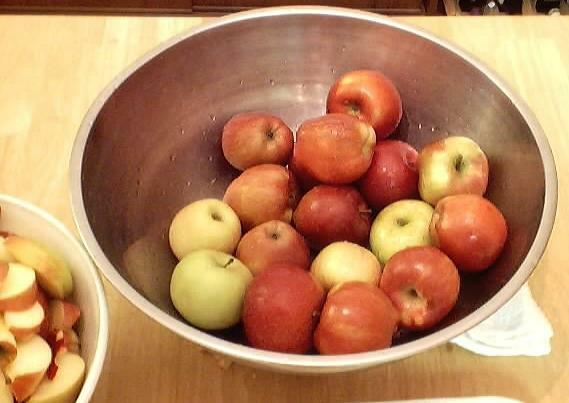 This year I used 4 bushels of red delicious and one each of Fuji, Yellow Delicious, Gala and Rome. This meant it was so sweet I did not need to add any sugar at all. And the flavor is great! The Fuji's and Gala's give it an aromatic flavor! You can also start with apple juice or apple cider (fresh, canned or frozen) - just use a type that does not have added sweeteners. You'll need 6 cups of apple juice and then skip to step 7. You can pick your own, or buy them at the grocery store. But for large quantities, you'll find that real farmer's markets, like the State Farmer's Market in Forest Park, Georgia have them at the best prices. In 2012, they were available from late September at $14 to $30 per bushel. 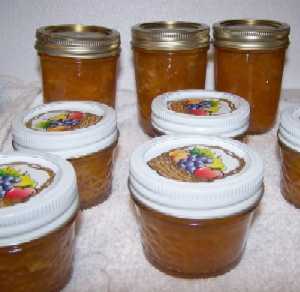 You'll get about 14 pints of apple jelly per bushel of apples. Step 3 -Wash and peel the apples! I'm sure you can figure out how to wash the apples in plain cold water and remove any stickers or labels on them. 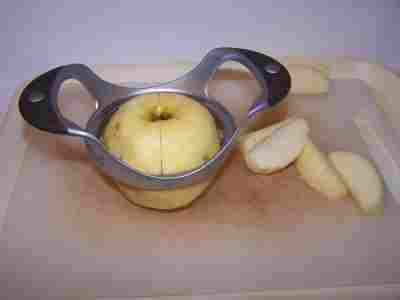 Using a vegetable peeler or a paring knife, peel the apples. Note: a steam juicer works best for extracting juice from crabapple, but the method below will yield the same results, it's just more work. Note: You CAN use a juicer, if you have one. In which case, just wash and chop the apples as the directions with your juicer require, juice the apples and skip to step 7. Juicing results in a more clear jelly, if that matters to you. Step 4 -Chop the apples! Chopping them is much faster if you use one of those apple corer/segmenters - you just push it down on an apple and it cuts it into segments. Pretty simple! 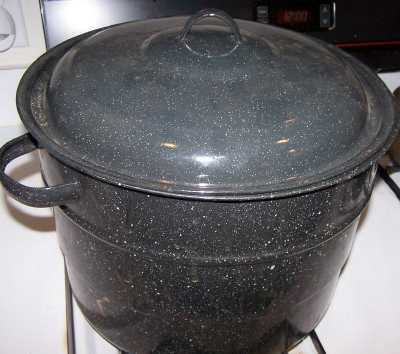 Put about 3 or 4 cups of water (I use filtered tap water) on the bottom of a huge, thick-bottomed pot. (about 2 inches of water in the pot). How much water to use is not an exact science, since some varieties of apples are much more juicy, and even the same variety varies depending upon the weather. 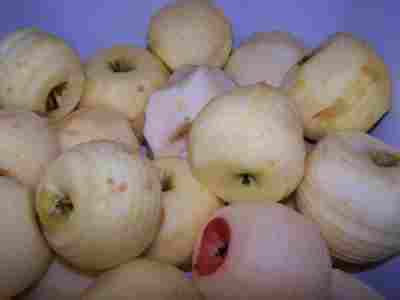 Honeycrisp, Delicious and Gala, for example, tend to be juicy/ watery; while most baking apples, like Rome, tend to be drier and require more water. Put the lid on, and the heat on high. When it gets really going, turn it to medium high until the apples are soft through and through. 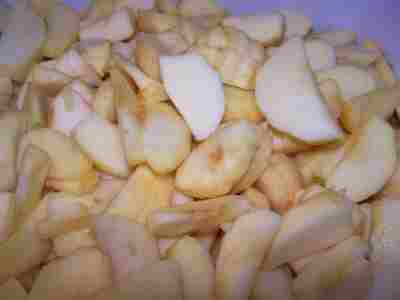 Yes, this picture shows skins (I didn't have a photo of this step with peeled apples) and you CAN leave the skins on; it just clogs up the strainer more and takes more time. On the plus side, leaving on the skins usually imparts a little more flavor, plus the color of the skins to the finished jelly! 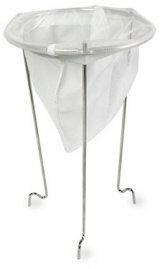 You can either put the soft cooked apples through a jelly strainer (about $9.00, see ordering at right, or pour them through cheesecloth in a colander. Or if you don't mind slightly chunky jelly, you don't need to sieve it. Just let the juice stand for 20 minutes, and Decant (pour off) the mostly clear liquid to use. Discard the bigger chunks of solids left behind at the bottom. 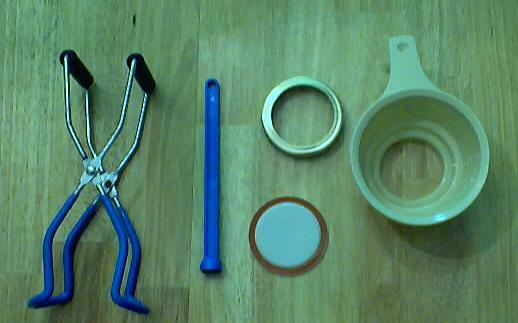 The only purpose of the sieve/filtering is to make a clearer jelly. The more you filter it, the clearer it is. But it tastes the same! Personally, I find the sieving step to be messy, wastes a lot of the apple juice and pulp and unnecessary; decanting is faster, easier and yields more. I pointed out in the ingredients list that you could start with apple juice, store bought or your own. 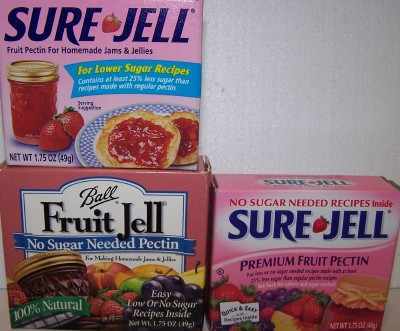 Depending upon which type of jam you're making (sugar, no-sugar, Stevia (but you will have to experiment with amount, each brand of Stevia is a different concetration), or Splenda, or a mix of sugar and Stevia (or Splenda) or fruit juice) you will need to use a different amount of sugar and type of pectin. The precise measurements are found in directions inside each and every box of pectin sold (every brand, Ball, Kerr, Mrs. Wages, etc. has directions inside). 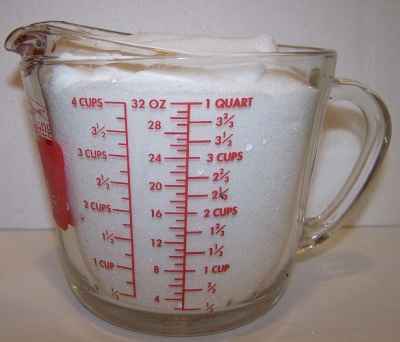 I haven't seen a jelly recipe that uses only Stevia (in a prepared form like Truvia, it measures same as sugar; if you use another form, you'll need do your own conversion) - or Splenda, if you prefer, , and I haven't yet tried it; I suspect it would taste bland. Notes about pectin: Apple jelly should only require about a half packet of pectin per batch, more if you are adding less or no sugar. With a little practice, you'll find out exactly how much pectin to get the thickness you like. 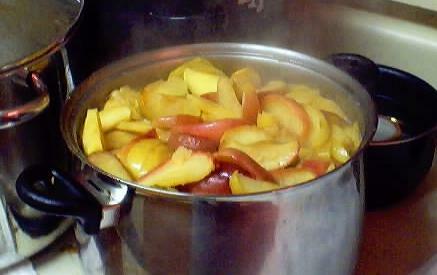 Stir the pectin into the apple juice and put the mix in a big pot on the stove over medium to high heat (stir often enough to prevent burning). 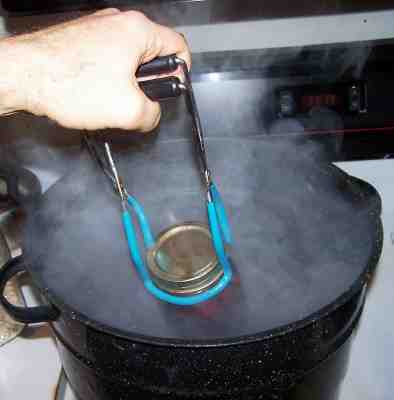 It should take about 5 to 10 minutes to get it to a full boil (the kind that cannot be stirred away). Some foam on the surface is normal. You'll skim it off later. 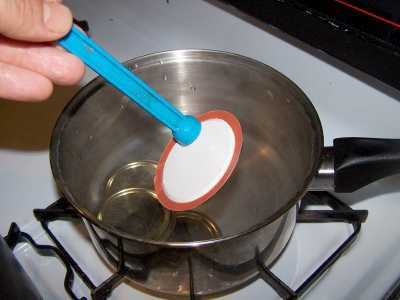 When the apple-pectin mix has reached a full boil, add the rest of the sugar (or other sweetener) or other sweetener, and then bring it back to a boil and boil hard for 1 minute. (Yes, I know the jam on the spoon in the photo is red - that was from making strawberry jam, but aside from the color, it should look the same).